Tiger Woods is set to make his return to golfing this week at the WGC-Bridgestone Invitational, and not only will golf fans get to see Mr. Woods take to the greens again, but they will also get a look at the new Nike Golf Free prototype. The prototype utilizes Free technology to the fullest, allowing Tiger "greater stability as he addresses the ball" also providing him with "the freedom of movement that natural technology delivers" which "will allow more power to be released through the swing rather than the body." The prototype — which doesn&apos;t have an official name yet — is comprised mostly of a polyurethane coated stretch fabric much like the one found on the Nike Hyperfuse 2011, and recycled Air Max units that have been melted down to form a thread that has been woven into a breathable textile material makes up the heel. 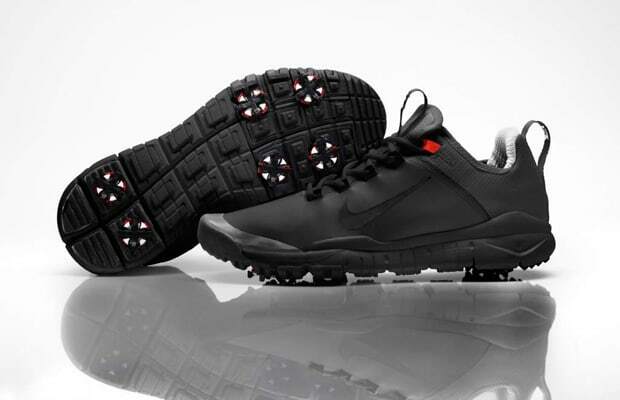 The Free aspect of the shoe was taken directly from the Nike Sportswear Special Field Boot, so we know Tiger is in good hands.